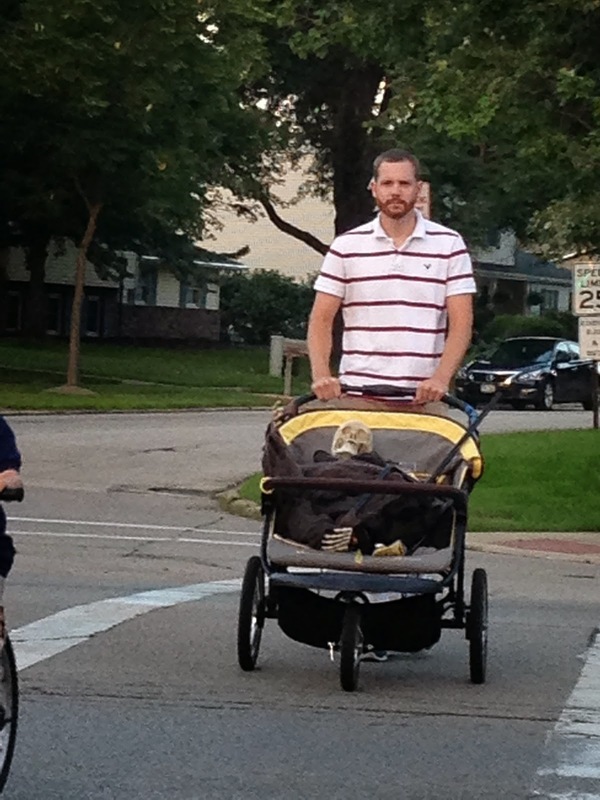 As I walked down the sidewalk with my family pushing a double stroller with a skeleton in it a neighbor said, "There is always something going on at your house." I really couldn't tell if she said this because she wanted to join in the fun or that she was thinking I have gone completely nuts! I am thinking it is the latter, but I would like to extend an open invitation to our neighbors to join any of our crazy author birthday celebrations. I must admit that this birthday celebration for Kevin Hawkes is one of the stranger things we have done to bring a book to life. However, I am thinking this was the perfect way to celebrate an artist whose work has been described as "offbeat or quirky." (Candlewick). Kevin Hawkes is the illustrator of over 40 books for children, including Weslandia by Paul Fleischman and When Giants Come to Play by Andrea Beaty. In an interview with Just One More Book he was asked if he prefers the writing or the illustrating and he responded, "I prefer the illustrating. I love taking a text and bringing it to life. I really like being able to create on the page something that is more than the story and adding to it, but not taking it in a direction that it is not supposed to." Hawkes worked as an assistant animator producing cartoons and as a photographic retoucher before taking a job working in the children's section of a bookstore. While working on this job he studied picture books and prepared a portfolio that would land him his first picture book contract for Then the Troll Heard the Squeak (1990). (Bio). In 1994, he was awarded SCBWI's Golden Kite Award for By the Light of the Halloween Moon by Caroline Stutson. Anita Silvey described Kevin Hawkes as "one of the most versatile illustrators working in children's books today. He adapts his style for each new book, shaping his art to the demands of the text." (Anita Silvey's Children's Book-A-Day Almanac.) He is best known for the New York Times best seller, Library Lion by Michelle Knudsen. There were so many books my kids enjoyed reading by Kevin Hawkes. It really started last month when we read The Road to Oz to celebrate Kathleen Krull's birthday. Then they fell in love with Westlandia by Paul Fleischman, Chicken Cheeks by Michael Ian Black, and My Little Sister Ate One Hare by Bill Grossman which was School Library Journal's Best Book of the Year in 1996. 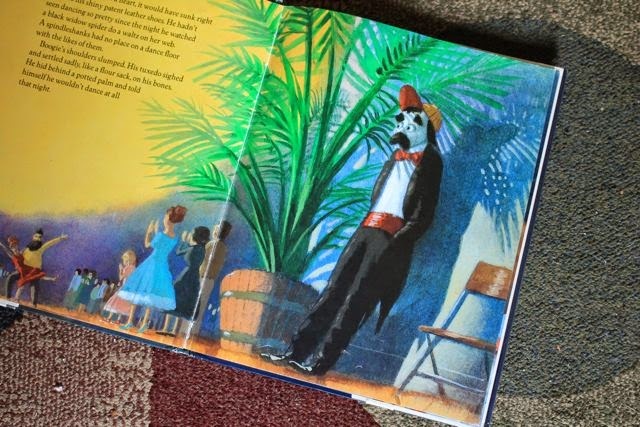 Boogie Bones by Elizabeth Loredo was the book that my youngest son loved the most and it was the book that became the focus of our author birthday celebration. Boogie Bones is a great dancer and his happy feet can move like no other skeleton in the graveyard. Being the best dancer makes him wonder if he can compete with dancers outside the iron gates. One day, a ball cap with a flyer advertising a dance contest blows into the graveyard. 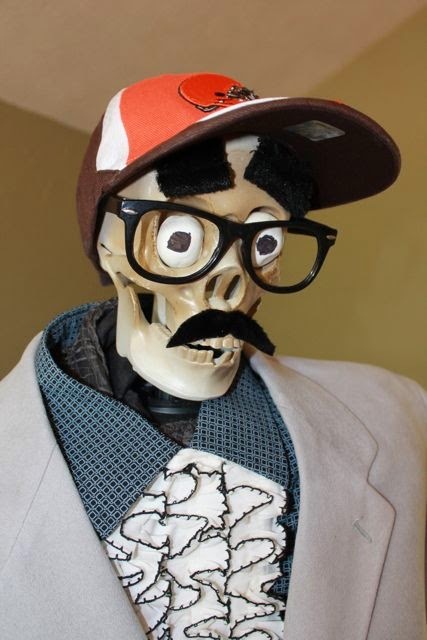 It is meant to be and Boogie Bones works up a disguise that will allow him to show his dance moves to people! He is nervous at first but works up his courage to start dancing. The crowd immediately notices Boogie Bones and compares him to Fred Astaire. Everything is going fantastic until his favorite song, Jumpin' at the Woodside is played and the crowd soon finds out who Boogie Bones really is. 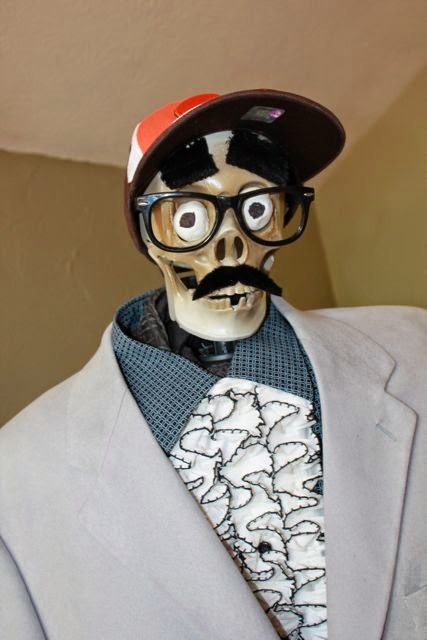 I asked my wife, a teacher, if she knew anyone from her school district who had a skeleton that I could borrow. I thought maybe a health teacher or a physical education teacher might have a skeleton stashed in the corner of their classroom. She thought for a moment and a family that lives in the neighborhood next to ours who have an elaborate Halloween display each year came to mind. She contacted them and they graciously offered one of their skeletons for us to use for this birthday celebration. 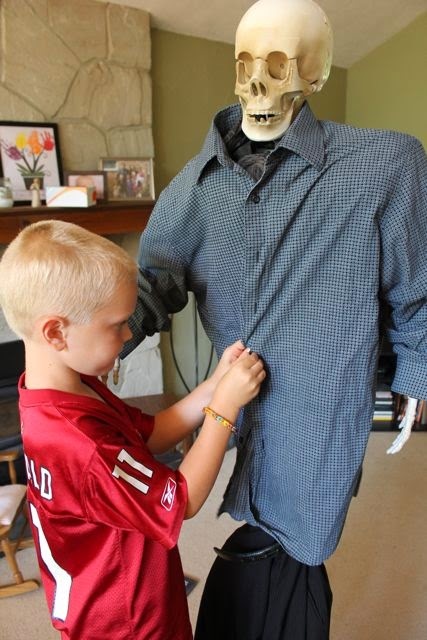 I was asked by our Halloween decorating extraordinaire neighbor, "What do you plan on doing with the skeleton? So I know which one to give you." I said, "We plan on dressing him up in a tuxedo." 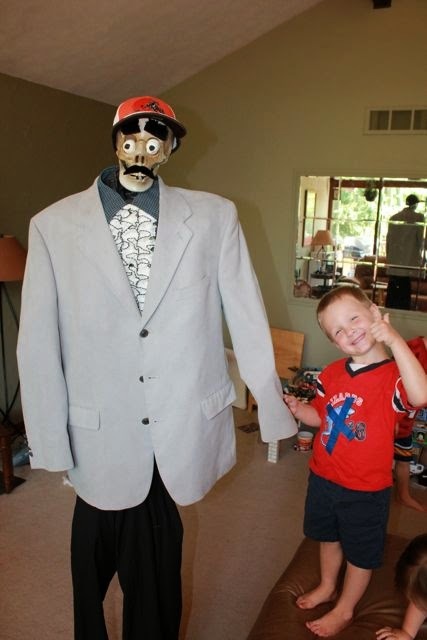 Before I knew it he was handing me a skeleton that could stand on its own, tuxedo pants, and a ruffled shirt! 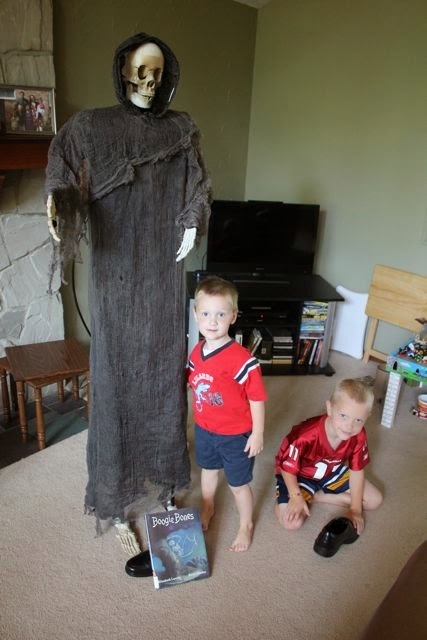 I was so excited and couldn't wait to bring Boogie Bones to life with my children. 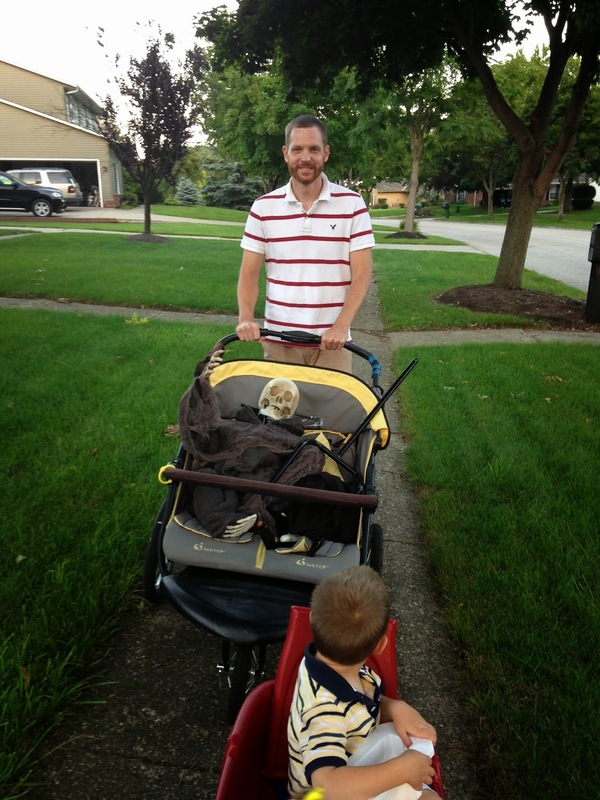 We loaded the skeleton into the stroller and headed home. We had to cross one busy road. Here is the neighbor who thinks I am nuts. 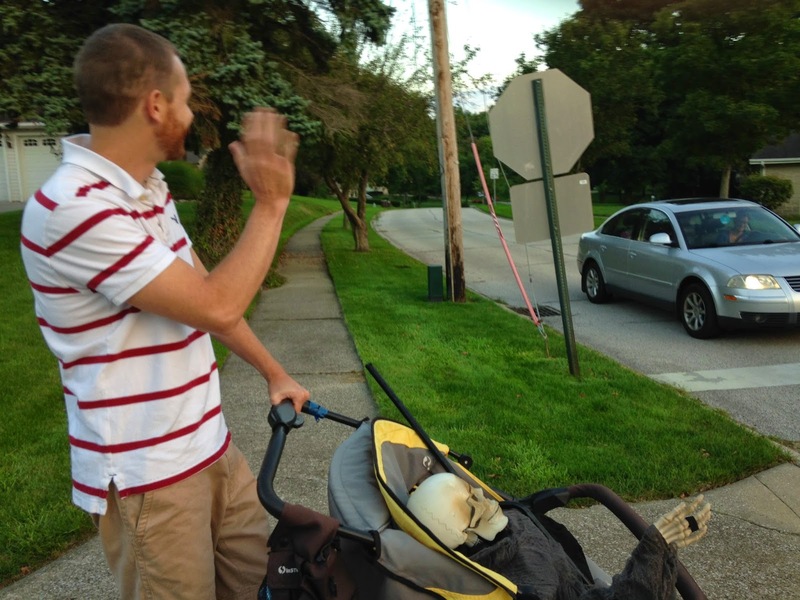 Maybe it was the fact that I was waving just like the skeleton. 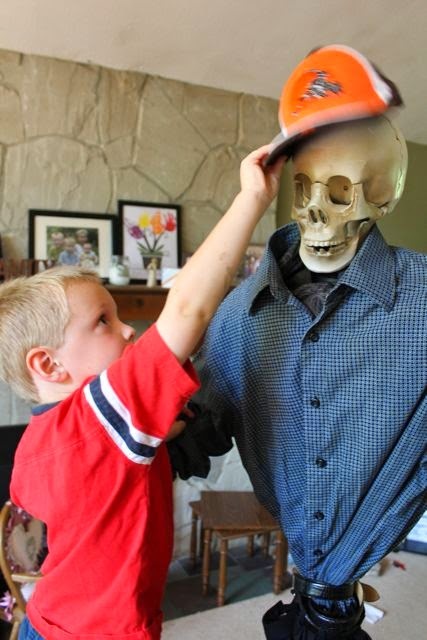 My boys were so excited to turn this creepy skeleton into the much more friendly Boogie Bones. 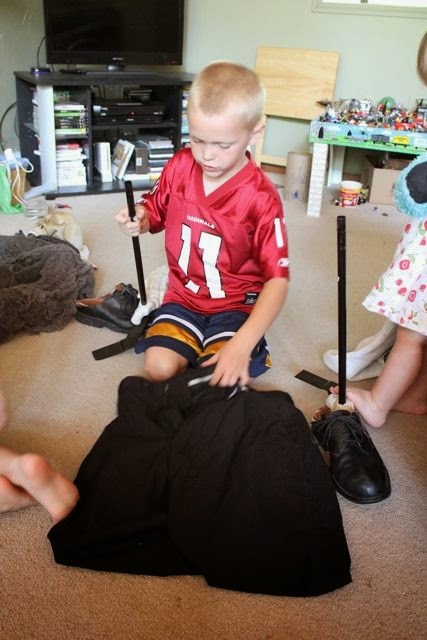 First we put shoes on his feet and pants on his legs. 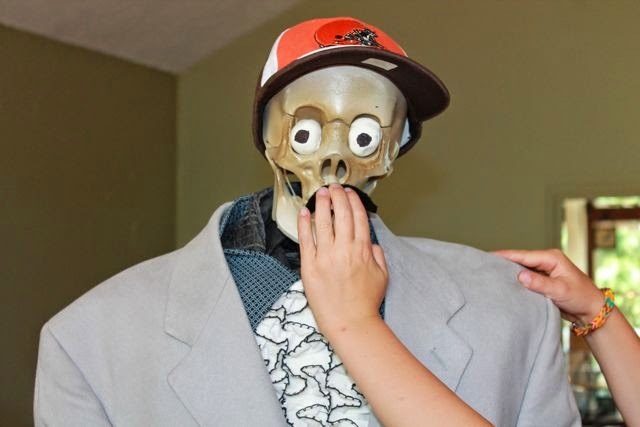 We found out that it was a little difficult to dress a skeleton. It was especially difficult to hold up the pants. This particular skeleton did not have a pelvis. Boogie's nice shirt was buttoned by my son. My other son placed the ball cap on his head. This was the one that blew into the graveyard that held the advertisement for the dance contest. The most important elements came at the end. We rolled Model Magic into balls to make the eyes. Lastly, we added a moustache and bushy eyebrows. 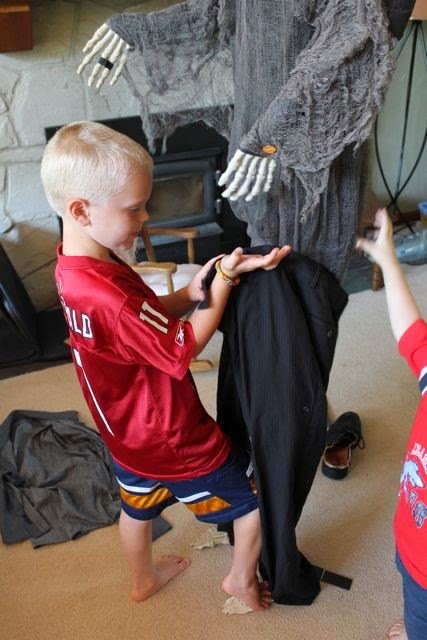 Boogie Bones came to life right in our living room! Whoa! 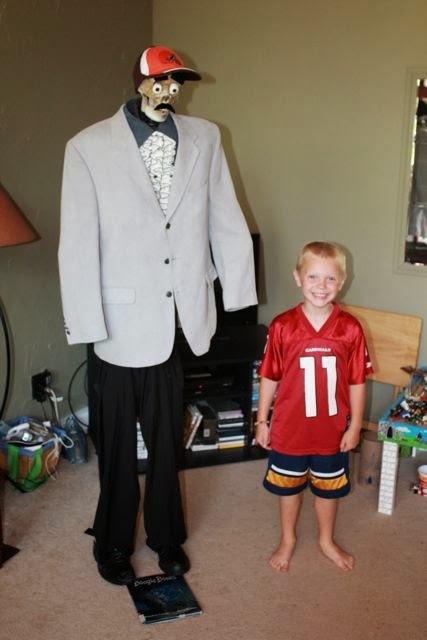 Boogie Bones is really tall! We thought he needed some glasses too. What a good lookin' guy! You should see him dance! Click here to listen to Jumpin' at the Woodside and use your imagination! A HUGE thank you to our friends for loaning us the skeleton to bring Boogie Bones to life and for not thinking we were nuts for wanting to do it! 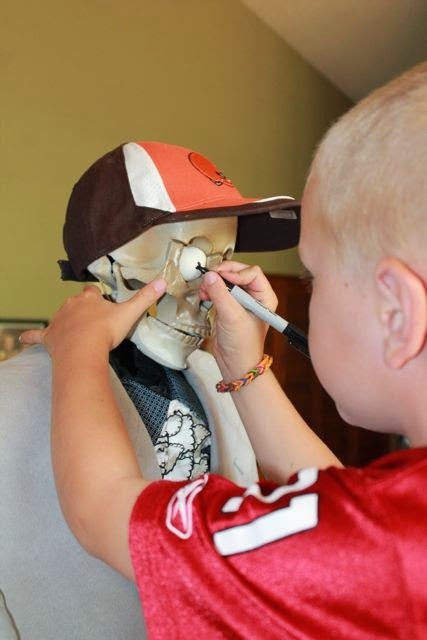 Maybe Boogie Bones could be a part of your Halloween display this year!